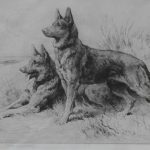 English Painter and etcher who specialised in works depicting dogs. Dicksee belonged to a family of artists including his father, sister and brother. His brother’s son Sir Frank Dicksee became president of the Royal Academy in 1924. Dicksee studied art at the Slade School, London, on a scholarship. His first painting was exhibited in 1881. 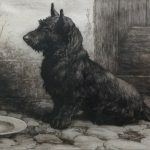 His works were frequently done from life and he is known to have kept numerous pets including dogs which were often featured in his etchings. Additionally he painted big cats at London Zoo where he became a Fellow. On his death his daughter Dorothy who was executor of his will was instructed to destroy most of the plates for Dicksee’s etchings.